Copyright 2013 Stride et al. This is an open-access article distributed under the terms of the Creative Commons Attribution License, which permits unrestricted use, distribution, and reproduction in any medium, provided the original author and source are credited. 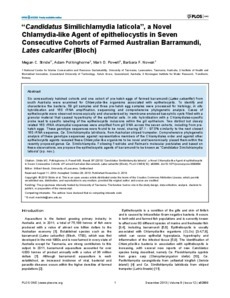 Six consecutively hatched cohorts and one cohort of pre-hatch eggs of farmed barramundi (Lates calcarifer) from south Australia were examined for Chlamydia-like organisms associated with epitheliocystis. To identify and characterise the bacteria, 59 gill samples and three pre-hatch egg samples were processed for histology, in situ hybridisation and 16S rRNA amplification, sequencing and comprehensive phylogenetic analysis. Cases of epitheliocystis were observed microscopically and characterised by membrane-enclosed basophilic cysts filled with a granular material that caused hypertrophy of the epithelial cells. In situ hybridisation with a Chlamydiales-specific probe lead to specific labelling of the epitheliocystis inclusions within the gill epithelium. Two distinct but closely related 16S rRNA chlamydial sequences were amplified from gill DNA across the seven cohorts, including from prehatch eggs. These genotype sequences were found to be novel, sharing 97.1 - 97.5% similarity to the next closest 16S rRNA sequence, Ca. Similichlamydia latridicola, from Australian striped trumpeter. Comprehensive phylogenetic analysis of these genotype sequences against representative members of the Chlamydiales order and against other epitheliocystis agents revealed these Chlamydia-like organisms to be novel and taxonomically placed them within the recently proposed genus Ca. Similichlamydia. Following Fredricks and Relman’s molecular postulates and based on these observations, we propose the epitheliocystis agents of barramundi to be known as "Candidatus Similichlamydia laticola" (sp. nov.).